Paderborn University supports you in the pursuit of your academic career at the university and when switching to career fields outside the university. In this context, postdoc scientists and academics can choose from attractive career opportunities in a whole array of different fields: For instance, you can pursue an academic career, take on responsible assignments in the areas of research and development or management and administration or else seek a career in the commercial or political sphere. Those pursuing a career in science or academia, are generally aiming at a professorship. A professorship offers outstanding scientists and academics the opportunity to independently conduct research and teaching activities, manage a specialist area, supervise junior scientists and academics in the relevant area and assume supervisory responsibility for a team. Prerequisites for the appointment to a professorship are outstanding scientific, academic or artistic achievements as well as the pedagogical aptitude for teaching at a university that can be obtained throughout various qualification phases. The first postgraduate qualification phase is completed with a doctorate. In general, the prerequisite for the award of a doctoral degree is a successful university degree (Master's, Magister, Diplom, State Examination). By successfully obtaining a doctoral degree, the junior scientists and academics prove that they have completed an independent research performance and have contributed to the advancement of knowledge in their discipline. The doctoral degree is then followed by the postdoc phase which aims at the deepening and broadening of the scientific, academic and methodological qualifications. The orientation phase is characterised by more independent research and publication activities. At the same time, this phase serves to reflect further career goals and as orientation for the own career opportunities within or - possibly - outside academia. In the advanced postdoc phase, those pursuing a professorship must now sharpen their profile in accordance with eligibility requirements. This can be achieved by different approaches (see below). The specialisation phase blends seamlessly into the appointment phase in which the candidate can apply for a tenured professorship based on their previously obtained experience. Usually, in Germany the completion of the habilitation (postdoctoral teaching qualification) launches the start of the appointment phase. Due to the many different options of obtaining habilitation-relevant qualifications and alternative paths available today, the specialisation and appointment phase have become more and more interwoven. The time from when an application for a W2- or W3-professorship has a prospect of success, depends on the individual scientific or academic achievements of the candidate as well as on the respective discipline and the relevant applicant situation. Please note: The general conditions for fixed-term employments for scientific qualification are set out in the Academic Fixed-Term Employment Regulations (Wissenschaftszeitvertragsgesetz). 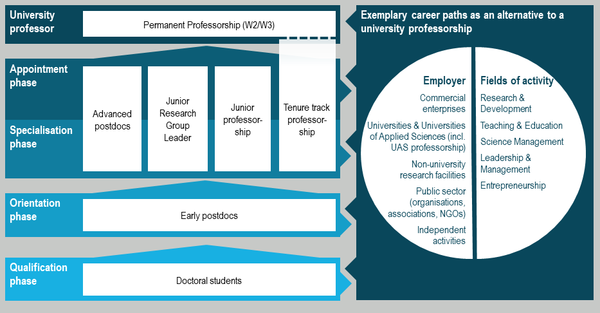 Junior professorships, which have been established in Germany since 2002, enable the candidates to combine independent research and teaching at an early career stage. After three years, an intermediate evaluation will be conducted which decides on the extension of the junior professorship by another three years. A junior professorship with tenure track enables the award of a tenured professorship under clearly defined conditions and performance requirements. For this, an intermediate evaluation (after three years) and a final evaluation (after three more years) must be conducted within the fixed-term probation period which generally amounts to six years. A junior research group leadership is a further path leading to a professorship and is characterised by a high degree of independent scientific or academic work and management responsibility in a group of junior scientists. The leadership of a junior research group can be organised as a university-own position or financed by external funds. A series of relevant funding programmes provided by various third-party donors (generally over a 5-year term) involve a corresponding level of funding, i.e. in most cases the funds for the own position and other staff. The traditional path to a professorship is by way of habilitation (postdoctoral teaching qualification). Habilitation means the capability to independently represent a scientific or academic discipline in the areas of research and teaching. The performances required for obtaining a habilitation include writing a scientifically or academically meaningful habilitation thesis, a presentation following by a colloquium and where applicable a lecture or course associated with the relevant degree programme. As an alternative to a habilitation, it is also possible to have habilitation-equivalent performances recognised in the appointment phase (depending on the university and discipline). A possible alternative to a university professorship is a professorship at a university of applied sciences (UAS). To become eligible for a UAS professorship, candidates generally require a doctoral degree and five years of practice-oriented activity in the relevant discipline (three years of which must be completed outside the university). Teaching activities make up a considerable part of UAS professorships, which is why teaching experience and – where applicable – further training in the area of university didactics are of great importance. The activities are also characterised by a strong application orientation and practical relevance, which is why practical work experience gained outside the university is also required. More information on UAS professorships in available in the relevant info box. Apart from the classical path to a professorship, there are a whole array of other attractive career opportunities open for postdocs for which they are often very well prepared due to their experience gained from their previous scientific or academic activities. One of the options at hand, is to continue to work at a high scientific or academic level outside the university – for instance in non-university research institutions or in the industry. On the other hand, postdocs are ideally qualified for high-qualified activities outside of academia. Within the scope of a doctoral degree programme (and where applicable other scientific or academic activities), the postdocs will have obtained versatile job-relevant competencies apart from their scientific and academic qualifications. These, in particular, include soft skills which comprise persona, social and methodological competencies (e.g. self-organisation and time management, project management, networking, teamworking skills, personnel management and intercultural competencies). Possible fields of activity are executive and management positions, activities in the field of education and teaching, science management or innovation and entrepreneurship. Postdocs can for example work in commercial enterprises, at universities, non-university research facilities as well as public organisations, associations or NGOs. A further option still are self-employed activities. More information on alternative career options available in the relevant info box.